A Word a Week Photo Challenge: Fly | Oh, the Places We See . . .
← Welcome news from Lesotho: Habitat house is complete! Probably any hot air balloonist asks the same question: Will my balloon fly today or not? Up ’til now, we’ve had little experience with hot air balloon launches, fiestas, flights, etc. 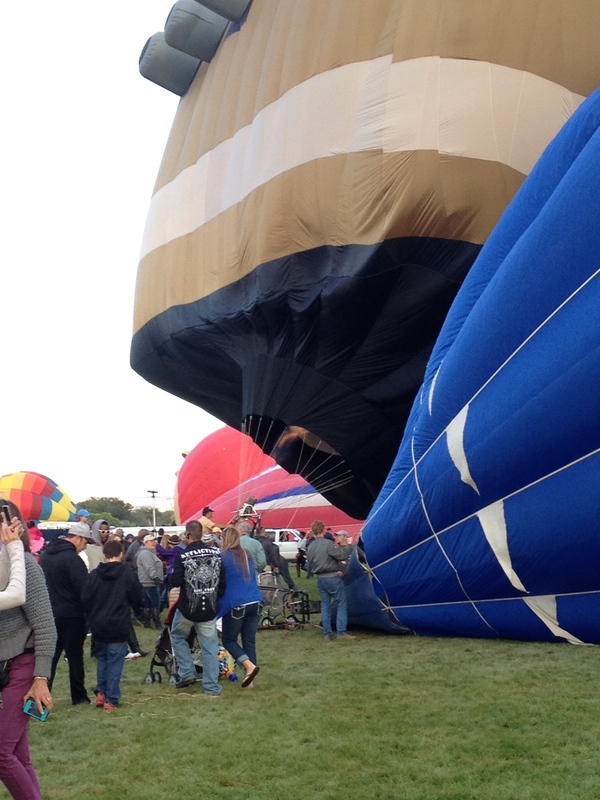 But Balloon Fiesta 2014: Spirit of the Winds changed all that. In an enormous field in Albuquerque, New Mexico, from October 4 to 12, balloonists and watchers asked the same question: Will it fly? Here are a couple that did . . . and a couple that did not! Humpty Dumpty filled right up, sucking in enough hot air necessary to puff up and fly! Even upside down, he was ready for lift-off, cheered on by a supporting crowd of students out of school on holiday and their parents who were kids for the day! 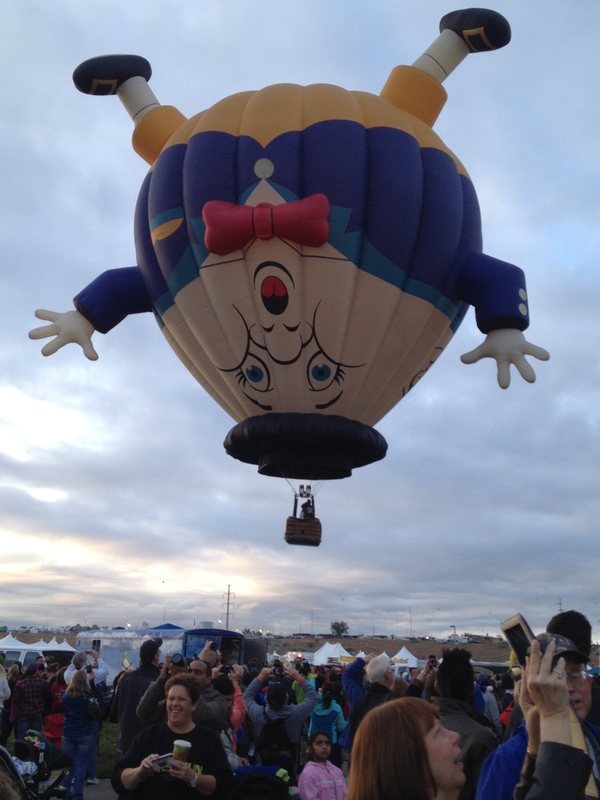 Filling Humpty with hot air: Will he fly? 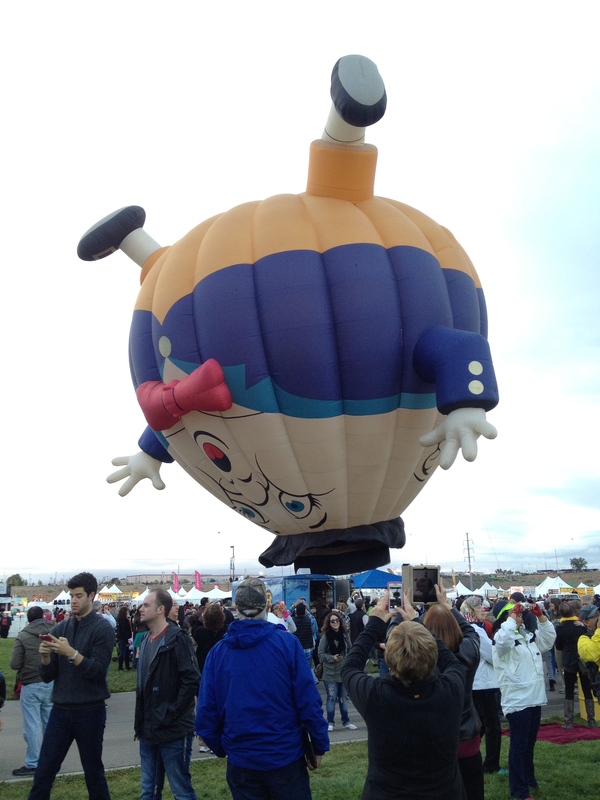 And Humpty takes off — Balloon Fiesta 2014! 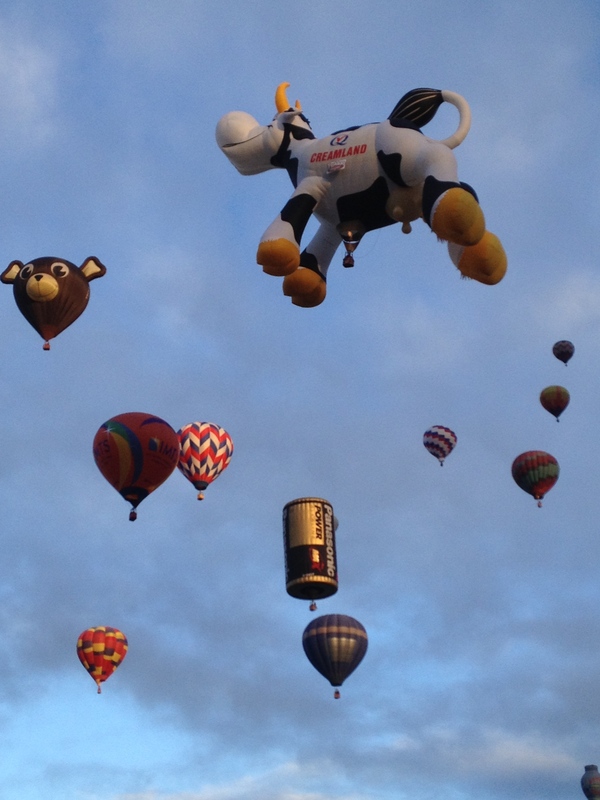 Yes, even cows fly as this entry named Airabelle from Creamland joins the skies — up, up, up and away! But, alas, not all balloons ascended. 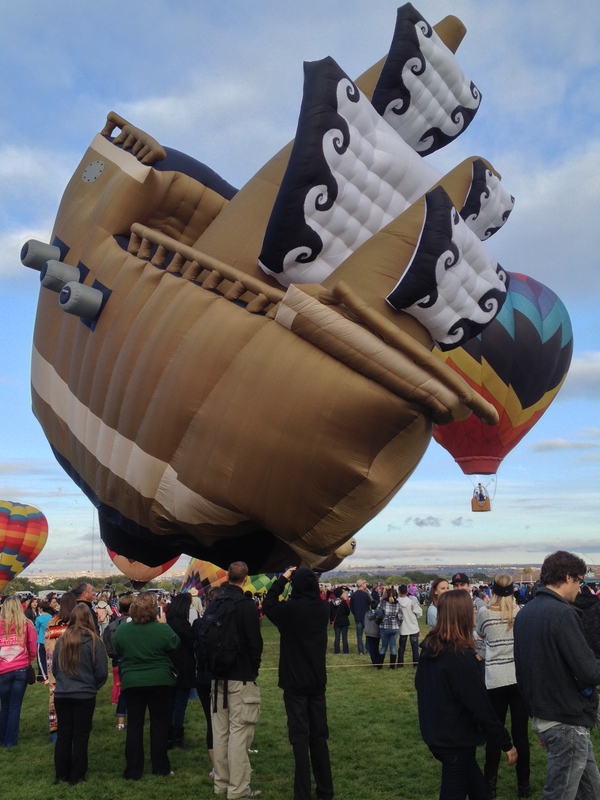 A big, brown sailing ship — one of the largest balloons on the field — struggled just to right itself. And then it just “hung out” with the crowd while its buddies took to the skies. Just moving with the wind, but not lifting off. No sailing for this ship today. 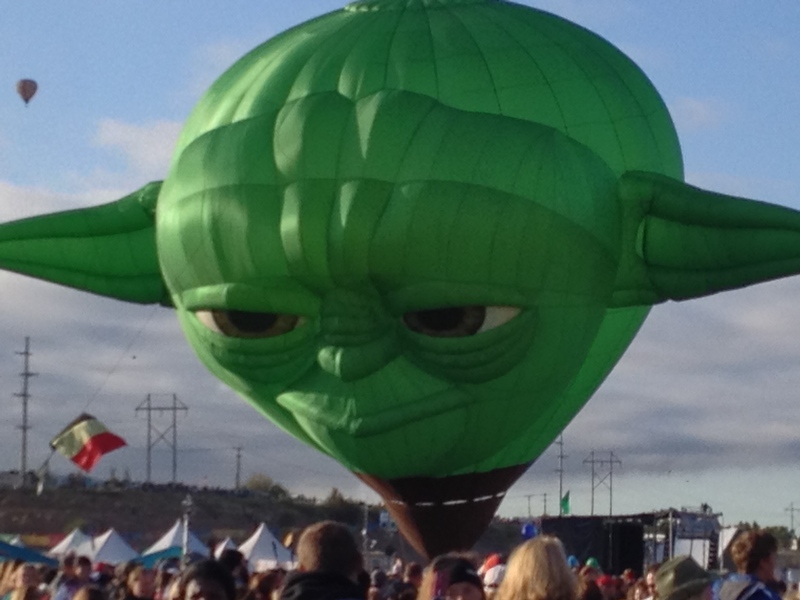 Even filled with hot air and in the upright liftoff position, Yoda never made it beyond the field. Didn’t matter. He owned that field! May the Force be with you next year, my friend. 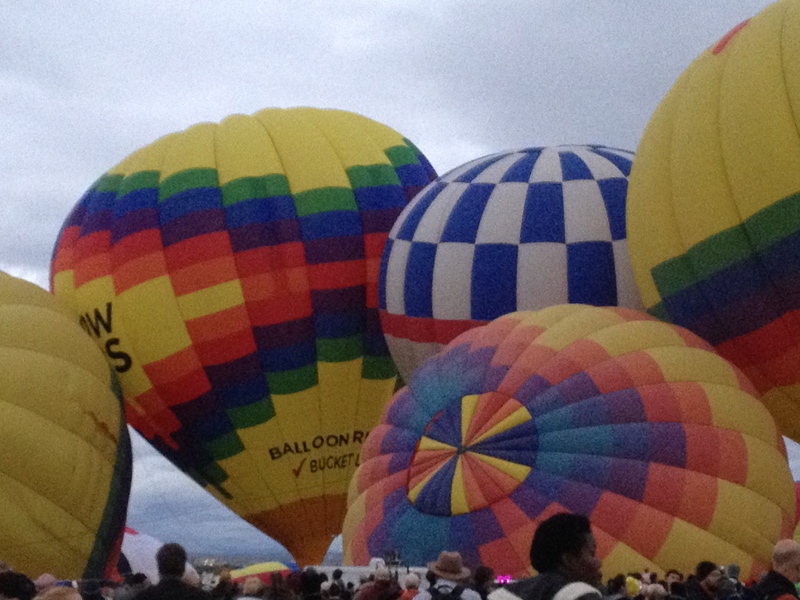 For more information on the Albuquerque International Balloon Fiesta 2014, click here. Want to help name Balloon Fiesta 2015? Click here to submit your idea! For more entries in A Word a Week Photo Challenge: Fly, check out Sue Llewellyn’s blog A Word in Your Ear. You’ll be flying high! 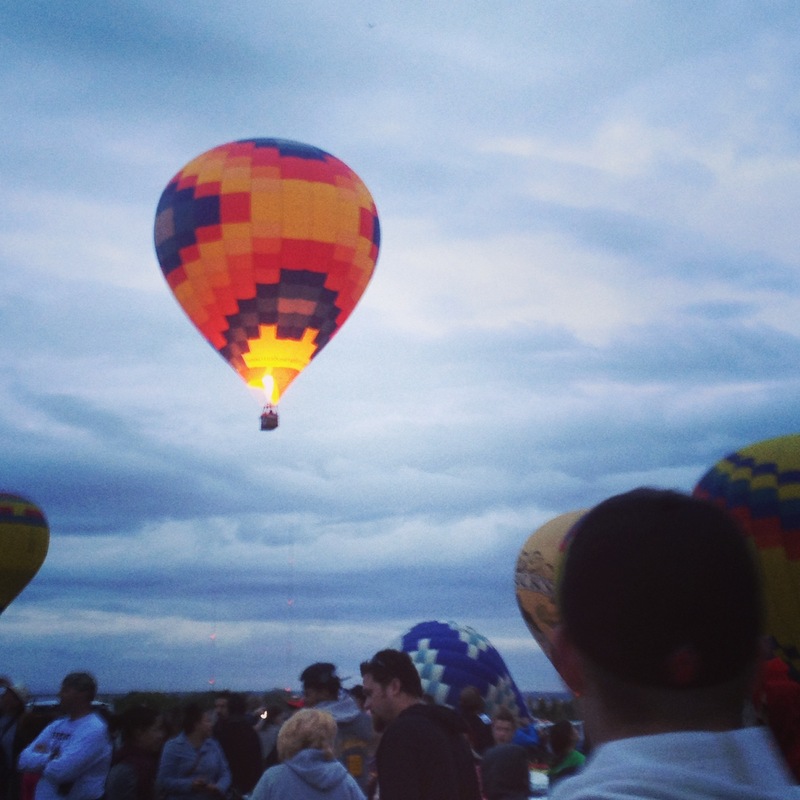 This entry was posted in A Word a Week Challenge, Destination, New Mexico, Photography, Travel and tagged Airabelle, Albuquerque, Balloon Fiesta 2014, balloonists, Creamland, Humpty Dumpty, New Mexico, Spirit of the Winds, Yoda. Bookmark the permalink. I love Humpty Dumpty and Yoda, what a great collection of balloons. As soon as I can sift through the other thousand or so pics I snapped excitedly, I’ll write more. It really was a fantastic experience! Thanks for taking a look. I love your photos of all the different balloons. Thanks so much. It was an even more fun event! Thanks so much for reading! It was fun, and if you ever get a chance to go to the annual event, get there early. It’s worth it! We had never seen this event either. But once we got out of bed and the crack of dawn and trudged the long way from the parking lot to the field, we were rewarded with a spectacular show! Have a great day! Humpty Dumpty is my favorite! We loved Humpty, too! And if I ever get time to download more pics, there are some others I think you’ll like, too. Thanks for reading! Haha, these balloons are fantastic! Upside Humpty is hilarious. There’s a lot of humor in these fun shape balloons, as they call them. I hope to post more in the future. So colorful — and many with a great sense of humor! Thanks for reading! So glad you liked the balloons. We were snapping pictures quickly, turning from one side of the field to the other trying to capture it all. I’ve always heard of this event, and if I lived closer, I’d be a regular! Amy, this was truly one of our favorite all-time events. From the host of volunteers who made it all happen to the many balloonists who start pre-dawn to put on a great show, it was well worth leaving the hotel at 4:00 AM to see! Thanks for commenting!